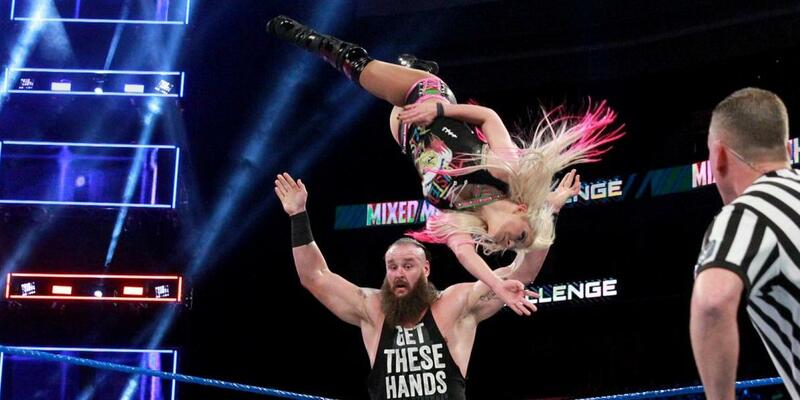 Welcome back to our weekly Mixed Match Challenge review! As always, the show doesn't go up on the WWE Network until Friday local time at the earliest, but I've got your hookup right here. If you're still staying along for the ride, we've got three weeks out of 10 already down, and I can say that this week's match is the best one they've pulled so far. The much-anticipated teams of RAW Women's Champion Alexa Bliss and the Monster Among Men Braun Strowman go up against Sami Zayn and Becky Lynch. The hype's mostly due to the odd-couple pairing of Braun and Alexa, and how good a Zayn/Lynch team would be. It's not perfect, but it doesn't disappoint. First, the matchup is great as it's a callback to two separate feuds: Becky and Alexa's solid SmackDown Women's Championship feud and Strowman and Zayn's short feud on RAW. Whoever's in charge of laying out these matches switched things up to good measure by taking advantage of Becky and Alexa's chemistry, having them start the match and giving them two to three minutes all to themselves. The not-so-great part, actually, lay with the men, even though they told a sensible story and maximized the use of the tagging rule. Sami Zayn was a full-on heel here despite how he approached Becky to be his partner, so a lot of his interactions with Braun involved trying to sneak up on him... aaand getting tossed around a lot. Obviously this isn't the underdog Zayn anymore. If you wanted something to get you on board with this whole tournament (two tournaments happening at the same time! The WWE loves tournaments too much now!) this is the match I'd watch. It just goes to show that the women can carry matches involving the men if they were simply allowed to. The bracketing for this particular match is nice, but I honestly wish this were a semifinal round match. Even though the tournament doesn't mean too much, this marks the third straight week that RAW beat SmackDown, and there's no choice but to have them do so because of how lopsided the seeding is. Bobby Roode and Charlotte have much better chances next week to finally have SmackDown win an MMC match, but I wish it didn't have to take them four weeks. I would've reorganized the seeds to have Goldust/whoever take on Zayn/Lynch, who deserve to score a win just for how likable they are. The face-heel dynamic works a little better this week as Braun errs toward the side of tweener, but it's sort of baffling for Sami to let Becky down after being so enthusiastic on getting her to be his partner. That said, Sami's disappointing performance should've been enough justification for Alexa to slap him at least once, or something. Does anyone realize that Braun and Alexa are the only ones so far with a legit double team finisher? How has no one thought of this before?